There’s no such thing as a bad microphone. Even a broken microphone has its uses…like making drummers happy who want mics on every element of their kit. 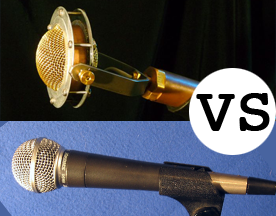 The most common microphones in the industry, the Shure SM57 and SM58, are considered by some to be bad mics because they basically require close miking. (For further discussion, see my podcast with Philip Graham on Condenser vs. Dynamic Microphones For Live Sound.) These mics have a crazy built-in EQ curve, can handle high SPL, and are made to be kissed. Try to mic a choir with those and you’ll be disappointed. On the other hand, try to use Philip’s Edwina microphone on a rock snare drum and you’ll likely find it overloading and eventually smashed by a stray drum stick. Most musicians and sound engineers would love to show up at a gig and find a box full of Neumann KMS105s, but they would be pretty disappointed if that’s all they had available. Most mics are built for a specific purpose. Unless you’re Earthworks, you’re making decisions in your microphone design for a specific set of conditions. Polar pattern is really important on busy stages, for example. How susceptible is the mic to noise and wind? Don’t forget that aesthetics is really important in theatre and film. People don’t want good sound, they want magic sound: invisible microphones that create perfect intelligibility in every part of the room. For cheap. I am guilty of judging equipment. Over years of work you develop relationships with certain brands. For example, when I lived in Lisbon I had some bad experiences while using Turbo Sound systems. I can’t even remember the details, but ever since then if I walk into a room with Turbo Sound, I assume the worst. I have to remind myself that tools are just that: tools. It’s not fair to blame the quality of an entire complicated system on one link in the chain. You have to start with a good source and design everything out from there to meet the requirements of the event. In another example, most people consider Behringer equipment to be prosumer grade (a cross between consumer and professional grades) at best, but you do see it on professional shows every once in a while. Their equipment does not have a good reputation for durability, but offers a cheap solution in a pinch. In a SIM3 seminar with Bob McCarthy, we compared the frequency response of a Behringer ECM800 ($60) to an Earthworks M30 ($650). Looking at the price and considering each company’s reputation, you would think the ECM800 is a bad microphone, right? Upon measurement, it turns out that the mic is perfectly usable in the mid to high frequencies. You probably wouldn’t want to use it to mic an acoustic bass, but it’s not bad. It’s just misunderstood.